Everest Nutrition is offering our readers a giveaway of a one month supply of Krill Oil, a value of $29.95. Krill Oil capsules are another easy way to add more Omega 3’s into your diet. They have numerous benefits over the standard fish oil supplements. Krill oil comes from tiny shrimp-like creatures that live in huge numbers in the Antarctic Ocean. Krill is the largest bio-mass in the world. The World Wildlife Federation and other agencies make sure that only a small percentage of the krill in the world’s oceans are harvested every year. Supposedly, the harvesting could go on for centuries before there would ever be any concern whatsoever that the environment would sustain any true impact. Krill oil is simply another way to get those Omega 3’s in! Krill is better than fish oil because it has less chance of being full of mercury and other heavy metals. Fish oil does not contain phospholipids, choline, and the antioxidant astaxanthin which is a pretty big deal. Phospholipids make up cell walls and choline helps to synthesize them. Choline is also essential for transporting cholesterol. Astaxanthin is a powerfully packed antioxidant that can help in many ways. As noted above, the oil of krill is more sustainable than fish oil as well. 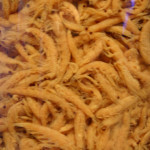 Everest Nutrition uses a proprietary extraction process to harvest the Krill, where they are collected and processed in their natural environment. Unlike fish, which are collected using nets, towed onto the ship into containers, and taken to a processing plant, Krill are collected through a unique eco-harvesting system which involves the net staying under the water during the entire collection process. While the equipment stays under water, a continuous stream of water flows through a hose or eco-portal, bringing the live fresh krill directly onto the ship that also acts as a floating factory. This means the fresh krill is processed immediately rather than storing it and then shipping it to a facility. The use of this eco-portal is not only gentle on the krill’s eco habitat, but this collection practice also ensures that the krill retains its potency and nutritional value. Using this type of process means that there is very minimal eco impact while increasing krill’s environmental sustainability. You can learn more by checking out Everest Nutrition’s blog. This product is also hexane free and free of impurities, including mercury and PCBs! For more information on this please visit the Consumer Lab Report and the IKOS report results (both are PDF documents). I have been taking a daily dose of fermented cod liver oil for years and years. It is second nature to me and at this point, the taste, texture and smell do not faze me. However, I know that cod liver oil and other fish oils are not always easy to get down the hatch. When I opened the bottle of krill oil capsules I was a little bit concerned. The brightly colored oil did not stay within the capsule walls and had coated the outside of each capsule. I gingerly grabbed two capsules, popped them in my mouth, and chased then down with some plain water. Much to my surprise, I did not taste or feel the oil on the outside of the capsule. My hands did not smell “fishy” either. Win! A huge plus is that Everest uses a “caplique” technology to encapsulate their krill. This means the ‘fish burps’ often associated with fish oil capsules are no longer an issue. While I no longer get fish burps from the cod liver oil, it is good to know that I can recommended the Krill oil capsules to anyone who isn’t a huge fan of the fish burps. And let’s face it – who is? What impresses me most about Everest Nutrition is the amount of care they put into the quality of the Krill Oil. They test their Krill Oil multiple times during the manufacturing process and make it in the United States. As I noted before, they source their krill from the Antarctic so you know you’re only getting the purest of oil. One of the best points about this product is simply the amount of pure omega 3’s found within each capsule. It is actually more than any of their competitors which means that you are getting more bang for your buck no matter what. Everest Nutrition also backs up their product with a no questions asked 90 day money back guarantee. This means that even if you take every single capsule in three bottles of Krill Oil they will still give you a full refund. This shows a real confidence in their product and for me, makes it an easy decision to try out the product. Plus, they are competitively priced and frequently offer special discounts, free shipping, and bulk purchase options. Is there a downside to Everest Nutrition Krill Oil? I think you get my point. Honestly, there really is not a downside to this particular product unless of course you have a fish allergy. Then yeah – you probably need to go ahead and pass on the krill oil! 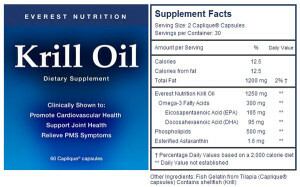 You can purchase your own Krill Oil at Everest Nutrition. The price can go as low as $19.94 per bottle with free shipping if you order 6. Trust me – that is an awesome deal! One bottle will run you $29.95 plus shipping. So is is better to stock up. For your own chance to win one bottle of Krill Oil from Everest Nutrition, enter by leaving a comment and using our Rafflecopter system below. The winner will receive a one month supply of Krill Oil. Contest is open to UNITED STATES residents ONLY. MANDATORY ENTRY:Simply leave your name and email address in our Rafflecopter entry form! Contest closes July 6, 2013 at 11:59 p.m. Eastern Time. Jennifer is a former government recruiter turned stay-at-home mama to a precious daughter (Tiny) brought earthside in March 2009. 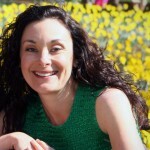 She is passionate about conscious, gentle parenting, natural health and wellness, holistic healing, real foods, coconut oil, and a Waldorf approach to education. Jennifer believes that it is extremely important for mothers to have a strong network of support and to that end has been active both in her local support networks as well as online support networks. I learned: Everest Nutrition surpasses the strict GMP (Good Manufacturing Practices) standards and all products are manufactured at FDA approved facilities. I learned that Everest Nutrition does not spend as much on advertising as competitors. I love the attention to detail and research that goes into their products! My hubby, daughter, and I would all appreciate some good krill oil! I will be the one enjoying the krill oil! I would use these supplements as my kids are too small yet to swallow capsules. I love that their nutraceuticals are all natural.